I had never seen a human or pet costume of a Fighter Pilot sitting in a Fighter plane ever in my life, that is why I chose to do this Homemade Air Force Fighter Pilot in Plane Dog Costume. Everything is connected to a baby stroller. I cut out the wings, front, back, and side of the plane out of foam board and painted it grey. I then connected the sides and back of plane to the stroller using wire. I made slits along side of the plane to slide the wings into. The front of the plane is a foam board folded to make it have three sides. It is the top front of the plane and the sides of the front of the plane. After it is folded I put Velcro tape on the insides of the front and on the outsides of the plane. I then connected the front. I cut out a steering wheel and put Christmas lights behind plastic small clear plates in the dash board area for the control panel, so it has a switch that turns the control panel lights on. I made a black seat with a cushioned back and put it in the stroller where the stroller seat is to make it higher. I used blinking red lights under each wing and a flash light in the front of plane for a headlight. I also stuck two flags in the foam boards in the front. I measured my dogs waist, legs chest and behind area to make pattern for fighter pilots suit. I have never seen pet clothes like what I made before, after making it I understand why. When making this closed complete jumpsuit for a dog it must be tailored real good. I used Velcro going up the front to close it. I put some patches on it and tied a flag scarf around his neck. He also has a toy gun with a gun holster. I hope my tips are helpful and someone else can enjoy making this for a pet or child, actually it could work for an adult too. 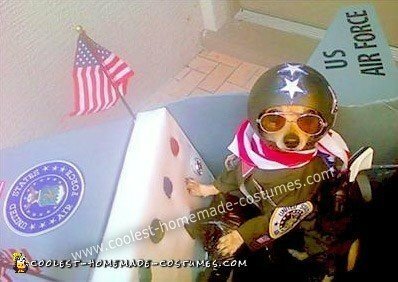 That’s the best pet costume ever!! How long did it take you to make?